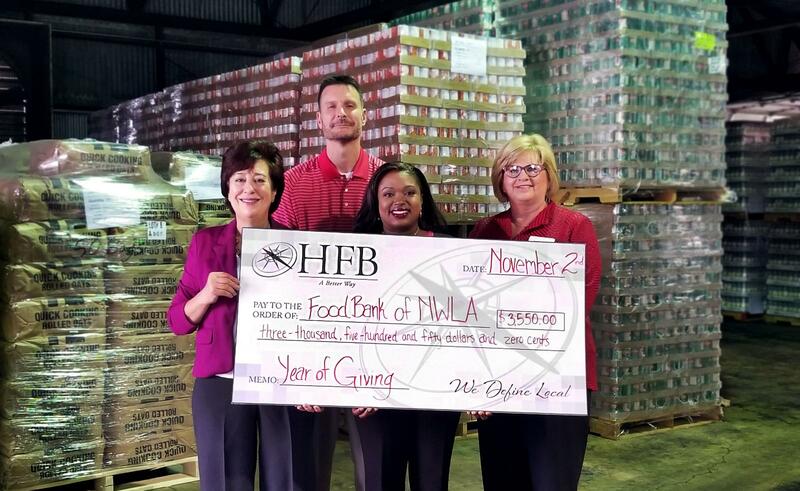 SHREVEPORT, La—Home Federal Bank (“HFB”), a wholly-owned subsidiary of Home Federal Bancorp, Inc. of Louisiana (NASDAQ: HFBL), recently donated $3,550 to the Food Bank of Northwest Louisiana in Shreveport. HFB is donating $25 to a local charity for each closed, residential mortgage loan in 2017 for their “Year of Giving”. Each quarter a local charity -- with a mission based around housing -- will be chosen to receive the donation. HFB closed 142 residential first mortgage loans during the third quarter of the year, continuing their “Year of Giving” with a donation of $3,550 to the Food Bank of Northwest Louisiana. “The Food Bank of Northwest Louisiana is a vital resource for so many in and around our community. We are proud to support their efforts in whatever way we can.” said David Barber, Sr. Vice President of Mortgage Lending for HFB. and Mary Jones, COO / SVP Retail, HFB.